Are you rethinking using “You old boot” as a criticism now? Thought so. 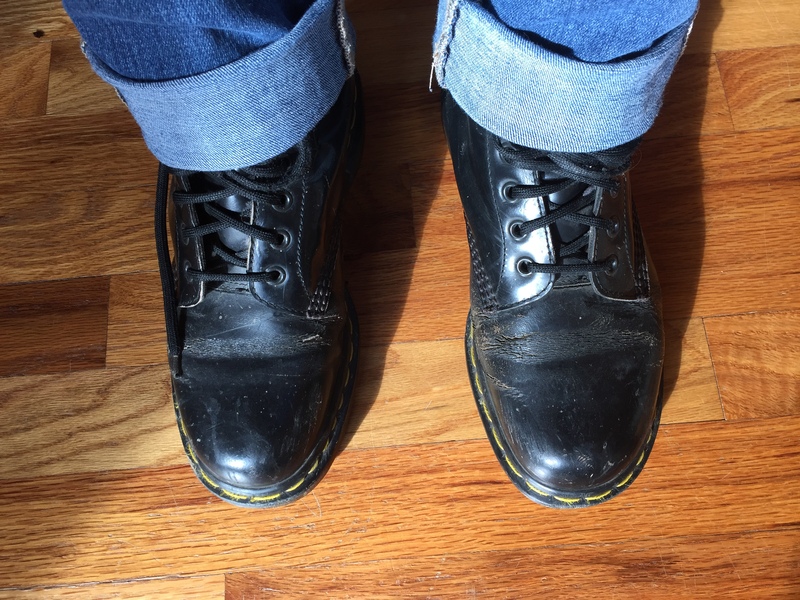 I bought my Doc Martens in the late 90’s during my senior year of high school. The only way I was able to afford them was through a unique alignment of the universe: 1) it was summertime, 2) they were 50% off, and 3) the cashier working in Pac Sun seemed under the impression that 50% off also meant additional reductions in cost through some arithmetic magic. I ended up getting the pair for less than $50, which was a steal for my waning Perkins’-plumped wallet (I was waitressing at the time to earn a little mad money and save for college). I am now in my mid-30’s, many years out of the hormonal tides of adolescence. Over the span of these years, I’ve gotten married, earned my doctorate, taken on a mortgage, and become a Mom to three children. The one constant on this journey? They have withstood the bitter salt and ice-laden roads of the Northeastern US, the harsh sun of mid-summer, and umpteen encounters with grapple (If you don’t know this particular form of precipitation, I encourage you to search it out. You’ll never look out your window and say, ‘I wish there was a word for these tiny ice balls’ again). They have remained true, despite the every-changing tides of fashion. Round toes, spike heels, elvish toe curls. No trend has defeated their stylish flexibility. I wore them to teach at my university this semester and received compliments from both colleagues and students. One regularly well-styled student asked where I got them, and the inner awkward teen in me rejoiced. Thank you, Doc Martens, for crafting a shoe that is both edgy and timeless. I look forward to the next few decades that we have ahead of us. Together.